Around the Year in 100 Posts! Today marks one year since I decided to start sharing my ideas with the world through Dolled Up Design and what better way to share then in my 100th post! I started this blog as an outlet for my creative ideas. I love reading other blogs and seeing their great parties, interior decorating and creative food ideas. I waste way too much time on Pinterest and decided I needed to start sharing back some of my own ideas rather then just creating board upon board of other people’s ideas. This is a creative outlet for me. I enjoyed my previous job as a graphic designer, but when I made the switch to being at home with the kids I felt my skills starting to fall to the wayside. I began this blog as a way to try and establish myself as more then just “Camden and Keira’s mom” and am hoping in the process I might inspire other people to bring out their creative side. I am surprised to see my post count as high as it is because it honestly doesn’t feel like I am able to spend as much time on my blog as I would like. Between keeping up with the kids and moving this past year, this is definitely an accomplishment for me. I am also proud and excited to have been chosen to join Moms & Munchkins as a Party Tip contributor so hopefully that gives me the push to come up with even more great ideas in the year ahead. I have tons of projects floating around in my head, but it is always a matter of finding the time to execute and document these great ideas! Like a lot of my projects, my blog is a work in progress. The overall look of the blog still leaves something to be desired and the linking up to all the different avenues of social media makes my head spin! There is definite room for improvement and I hope as I move forward and my blog continues to grow that it only continues to become better. So, in celebration of One year and 100 posts, here are my top 10 favorite Dolled Up projects from the past year. Click on the links to view the full posts! And, because it is Thursday, it only seems fitting that I throwback and link to my very first blog post – my Love is Sweet personal candy buffet. I would like to finish this post with a big thank you to all my readers old and new! You are the main motivation for this blog and I can’t wait to share more projects and ideas with you in the year ahead. This party was so much fun to plan and execute! I love planning parties for my son, but there’s just something about the opportunity to use ruffles and bows that is that much more exciting for me. The inspiration for her second birthday party came from some of Keira’s favorite toys – her Fisher Price Disney Princesses and Playsets. I am not a huge fan of a lot of the Disney Princess merchandise out there, but I love the Little People versions because they are just so cute! Santa brought her the Disney Little People Castle for her first Christmas and her auntie Erin ended up buying her the adorable set of Snow White and the Seven Dwarfs to go with it. 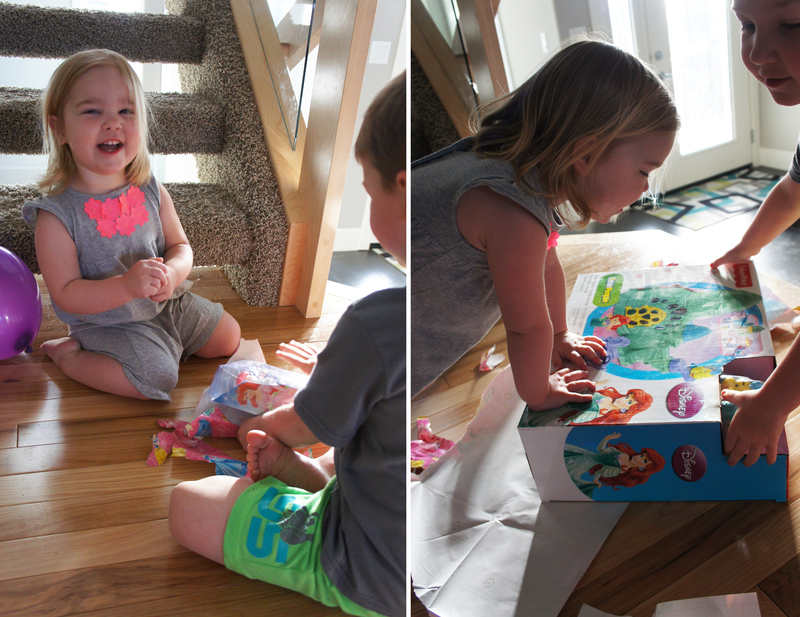 This past Christmas they came out with a Dwarves cottage and Ariel playset so she ended up getting the cottage for Christmas and she was excited to get the Ariel set from her brother for her 2nd birthday. In a few short weeks my baby will be turning two. I am a wee bit sad to be officially moving out of the baby stage, but excited to see the little lady she is blossoming into. The invites are out so I am excited to share what I have come up with for her birthday invitations and party theme! I love having a little girl because it means I can go all out with the bows and frills for the party. Princesses are a pretty common theme for little girls so I wanted to take a stab at it, but wanted something a little less common. Keira has a Fisher Price Little People Castle with all the Disney princesses that she loves and for Christmas she got the matching Snow White’s cottage. We have the full set of Dwarves to accompany Snow White and I always thought they were adorable so I decided that Snow White would be the perfect inspiration for her party. I drew up a graphic of the Little People version of Snow White to use on the invites and will be incorporating it on the cupcake toppers and throughout the party. The only thing cuter then the Little People Snow White is my own Snow White! Seriously, how sweet and adorable is she? (I may be a bit biased!) I picked up this Snow White costume at clearance after Halloween and was happy that she was cooperative enough to let me get a good shot for the invite. I got a few other good shots that I think I will print and use in frames on the party tables. My original thought was to have her wear the Snow White dress for the party, but I don’t think that is very practical for our playground venue. 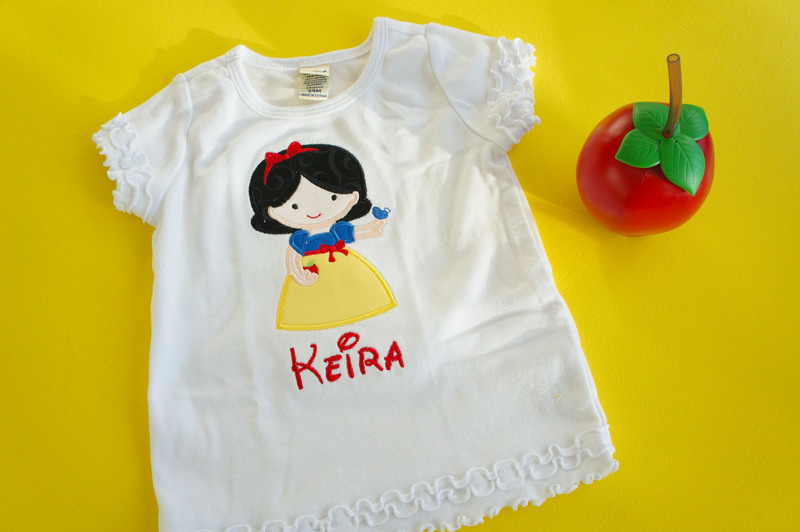 I ended up ordering this adorable custom shirt and can’t wait to have Keira wear it! Be sure to check out MissDelaneyShop on Etsy to find this and other great princess or superhero shirts and dresses! I still have lots to do for the party, but I am excited to see the details coming together. The party will have a picnic spin with picnic type foods and, of course, lots of apples! I can’t wait to share everything with you in a few weeks. 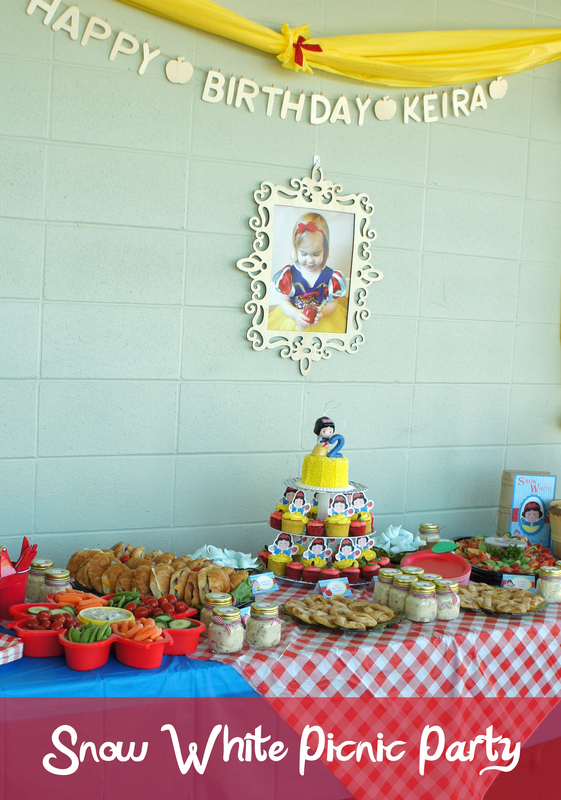 Be sure to check out my Snow White Party pinterest board for more ideas!